RegGen is a toolbox for the integrative analysis of regulatory and expression data from ChIP-Seq, RNA-Seq and biological sequences. The tool provides several functionalities required for regulatory analysis as Chip-Seq peak calling, transcription factor binding site detection and association to further experimental data as gene expression. ODIN and THOR are HMM-based approach to detect and analyse differential peaks in pairs of ChIP-seq data. ODIN is the first differential peak caller that performs genomic signal processing, peak calling and p-value calculation in an integrated framework. THOR extends ODIN by supporting replicates and further normalization approaches. 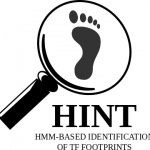 HINT (Hmm-based IdeNtification of Transcription factor footprints) is an hmm-based framework that uses open chromatin data (DNase-seq, ATAC-seq and histone modification ChIP-seq) in order to find transcription factor footprints in the DNA. HINT makes part of the Regulatory Genomics Toolbox suite. Please find more information about the tool in the RGT website. Provides multiple motif analysis common operations such as motif matching and motif enrichment. All analyses allow experimental flexibility and use the Regulatory Genomics Toolbox (RGT) framework. Please find more information about the tool in the RGT website. Pymix – Mixture model estimation package in python. GHMM – A General Hidden Markov Model library in C.